We had a great experience doing Winter Field Day at Falling Waters State Park, Florida. The participants were Bob KK4DIV and his stepson Michael, Chris VA3ECO, Dennis WA6QKN and myself N4KGL. Our call was N4Y, the category was 2O, and the section was Northern Florida. Our power output was at QRP levels less than 10 watts and 5 watts on CW. Our power source for the radios were batteries. 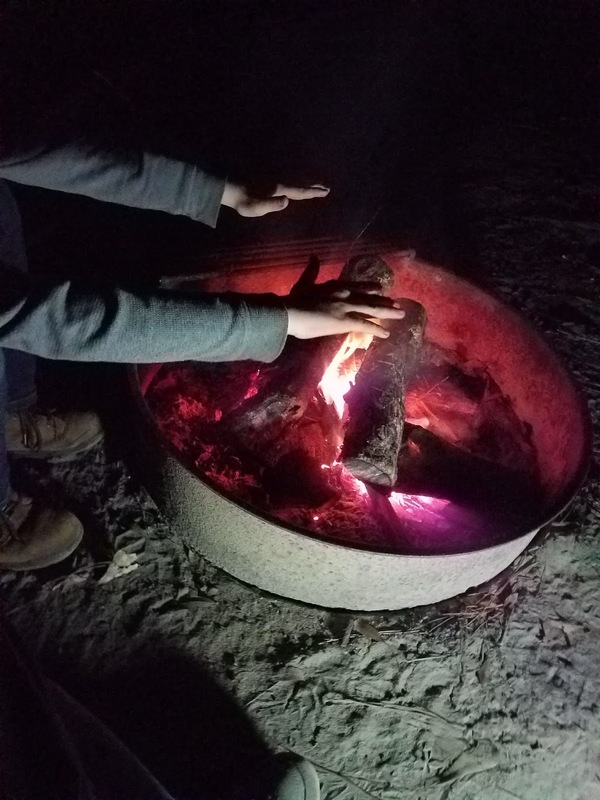 We arrived Friday, January 26th for the night. The 24-hour event started Saturday at 1PM CST. Both Bob and I had campsites across the road from each other. We both used tents. The social part of the event was fun. Chris volunteered to be the camp cook. 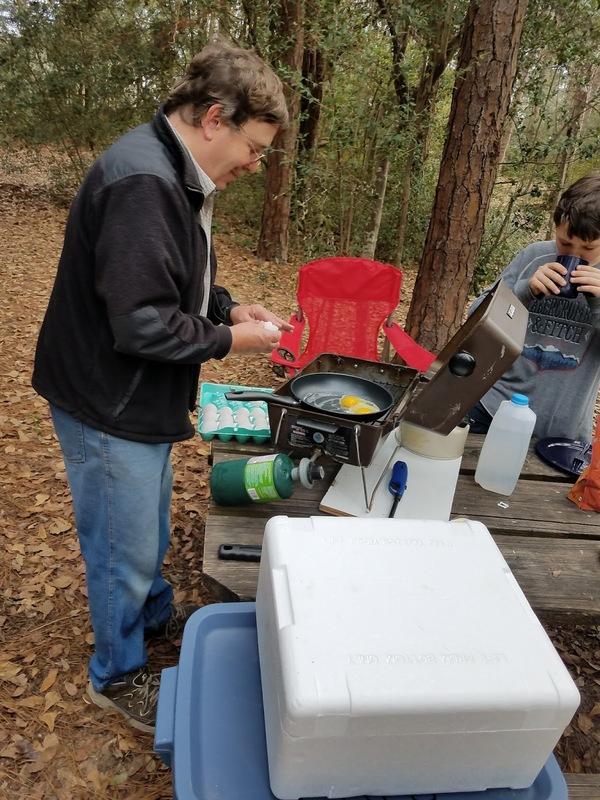 He cooked eggs for breakfast and Saturday night he warmed up his wife's chili. Dennis supplied ice cream on Friday Night and key lime pie on Saturday night. Bob's Stepson Michael rode his bike around the park. However, he picked up quite an interest in the radios. Michael made some on-the-air contacts. He is now all fired up to get his license. There were plenty of hands to help with the setup. Tom WB0HBR and his wife Sandy came up on Friday afternoon. 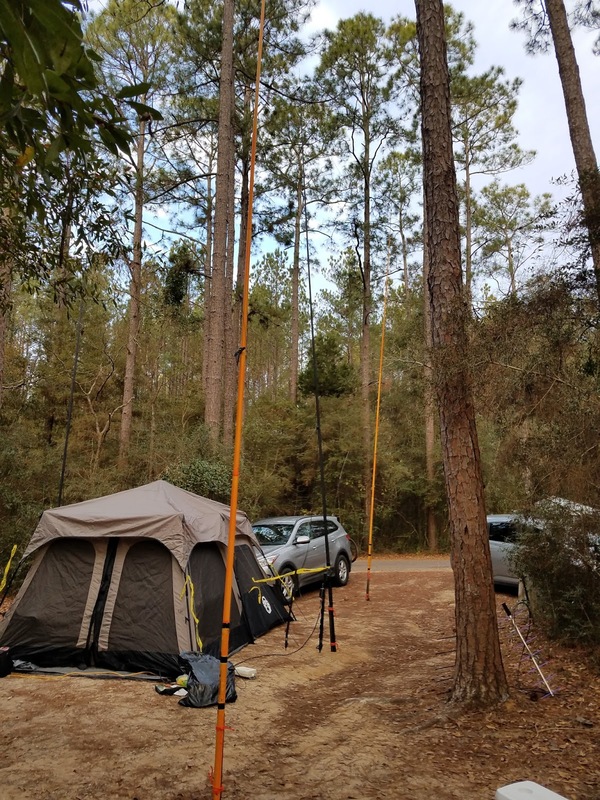 On the technical side, Bob used his Yaesu FT 817, and an off-center-fed dipole hung from the trees. 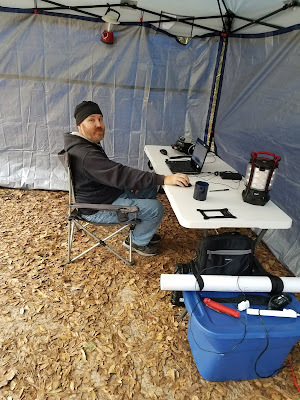 I used an Elecraft KX3 with a PX3 Spectrum Scope. 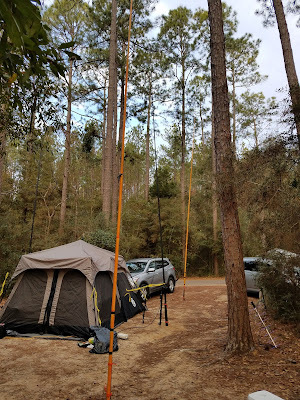 My antenna was a 100-foot loop 30 feet across and 20 feet vertical supported by three 30 foot poles and fed at the bottom center with some ladder line. My initial plan was to use the Icom AH-4 tuner and an Artcraft adapter box. The box and tuner work fine, but it was just too cumbersome to use for the pace of the event. I switched the Icom tuner for a Chameleon 5 to 1 transformer and used the internal tuner in the KX3. Chris VA3ECO preparing breakfast. Thanks Chris! As you would expect QRP takes more effort to make contacts than 100 watts. We did get 20 CW, 21 digital and 20 SSB contacts. 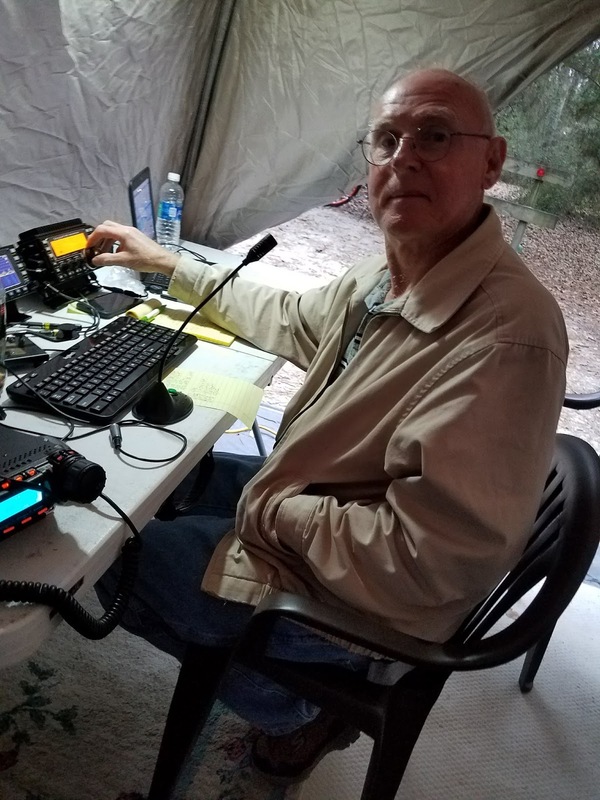 I was impressed that Bob's FT 817 with 5 watts got almost all the digital contacts and some on SSB. Our QRP contacts do count twice what it would have been at 100 watts per the rules. 74% of our contacts were on 40 meters. The rest were 13% each on 20 and 80. Bob used 10 by 10 canopy for his operations. He had a four-person tent that he and Michael slept in. On my side, we used a 14 by 10 tent for operating and sleeping. It fit the bill. We got several inches of rain Saturday night into the morning. 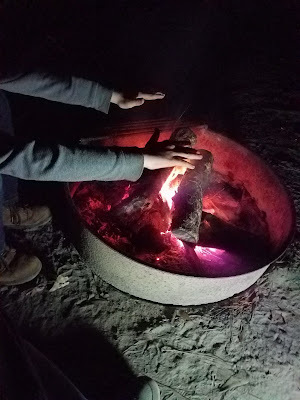 There was some water seeping in on the floor of the eight-person tent. The water chased Chris out to his car as he was sleeping on the floor with a foam pad. The event was enjoyed by all, and we would do it again next year. Chris is just down for the Winter from Canada. 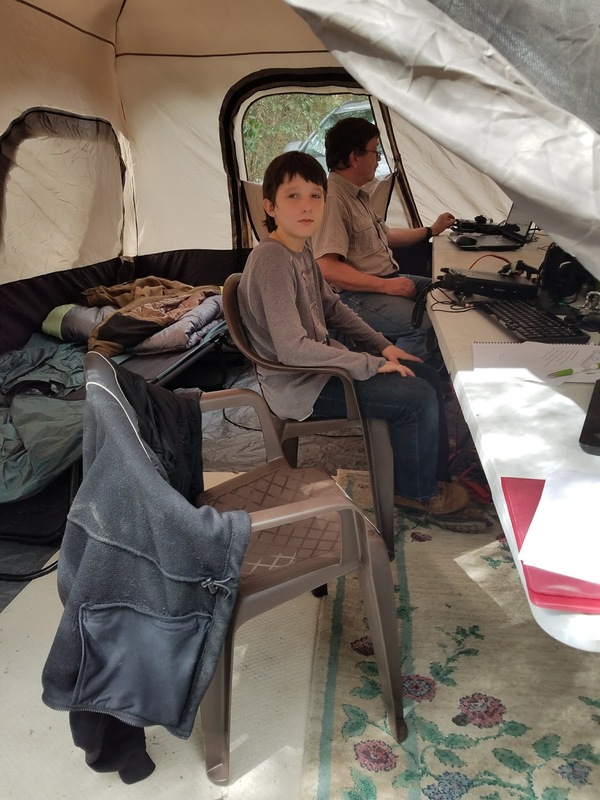 All this is good practice for the ARRL Field Day in June. I have a reservation for the same site plus the adjacent one. However, I am considering switching to a pair of campsites across the road that are next to a large open field. I feel that Winter Field Day is growing based on the on-the-air activity. We are looking forward to both events in the coming year.